DriveOhio and the Ohio UAS Center to bring smart mobility to every altitude. COLUMBUS, Ohio -- Smart mobility doesn’t start and end on the roadways, it’s taking off in the skies as Ohio recognizes the need to advance unmanned aircraft systems (UAS) technology, known commonly as drone technology. As a result, DriveOhio, the state’s center for smart mobility, and the Ohio UAS Center today announced a new strategic plan to support UAS research and development, facilitating the state’s ongoing leadership position in this transformation technology. With this plan, Ohio demonstrates its commitment to investing in the research and infrastructure needed to advance UAS technology in developing new jobs, business investment and economic growth. The strategic plan announced today will tackle three main initiatives: FlyOhio to develop an unmanned traffic management system, bringing about the widescale use of drones for delivery and transport; Ohio UAS Center Operations to facilitate the use of the technology for a broad range of business services; and Workforce Development to educate and create the skills needed for smart mobility jobs around this technology. FlyOhio: Drone technology is already capable of transporting packages and people. However, there is no unmanned air traffic management (UTM) system in place that ensures drones can fly safely at altitudes below 2,000 feet, so government regulations require operators to always be in view of their aircraft. FlyOhio is researching SkyVision with the Air Force Research Laboratory (AFRL), a $5 million ground-based detect-and-avoid radar system at the Springfield-Beckley Municipal Airport. Additionally, FlyOhio will explore a second UTM solution along the 33 Smart Mobility Corridor, a 35-mile stretch of highway between Dublin and East Liberty, Ohio, which is already a testing ground for autonomous and connected vehicles and communications. Finally, FlyOhio will identify locations that can accommodate aircraft that takeoff and land vertically(known as vertiports), increasingly important as unmanned package delivery and transportation advance. As workforce development is a core part of DriveOhio’s mission to support and advance Ohio’s smart mobility future, initiatives like these go hand-in-hand with new projects, helping to prepare workers for jobs in this new UAS sector. 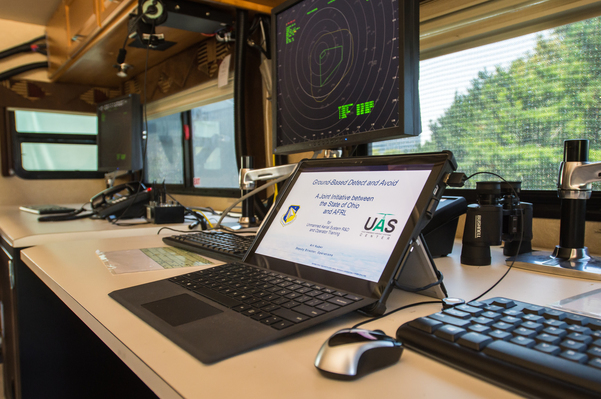 Operating as part of DriveOhio, the UAS Center, located in Springfield, Ohio, serves as the state’s one-stop shop for those developing, testing and deploying UAS technology in Ohio. As both UAS and autonomous and connected vehicle technologies advance, these teams work collaboratively on air and ground-based smart mobility applications, leveraging resources to make smarter decisions and avoid duplicative efforts. To read the DriveOhio and UAS Center Strategic Plan in its entirety and access additional resources, please visit UAS.ohio.gov.